NEWPORT NEWS, Va., March 8, 2005 (PRIMEZONE) -- Northrop Grumman Corporation (NYSE:NOC) reached a construction milestone by lowering the final keel section of the George H. W. Bush (CVN 77) aircraft carrier into place. The 700-ton lower bow unit was joined to the other keel sections in the dry dock and completes the length of the carrier, which is as long as the Empire State Building is tall. "It's an awesome sight to see the lower bow unit join-up with the rest of the ship. It really starts to take the shape of a carrier now, and this important milestone brings us one step closer to our launch goal," said Scott Stabler, vice president for the CVN 77 program at Northrop Grumman's Newport News sector. 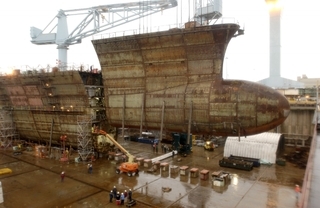 Newport News is building the George H. W. Bush using modular construction, a process where smaller sections of the ship are welded together to form units called super-lifts. These super-lifts are hoisted and lowered into dry dock with the sector's massive 900-ton crane. The lower bow unit is the 98th of 161 super-lifts used to build the carrier. Made up of 13 steel sections, the lower bow is one of the heaviest super-lifts and is the last major section of the ship below the waterline to be lowered into place in the dry dock. The George H. W. Bush is the second carrier to have the new bulbous bow design that provides more buoyancy to the forward end of the ship and improves hull efficiency. Construction began on the lower bow last March. The George H. W. Bush is the tenth and final Nimitz-class aircraft carrier. It will incorporate many new design features including an updated aviation fuel distribution system and new marine sewage system. The controls on the carrier's bridge and propulsion plant will be automated and other key technologies being evaluated for incorporation include the development of a composite main mast and enhancements to the ship's computing architecture and mission planning capability. The George H. W. Bush's keel was laid in 2003. The christening will occur in 2006 with delivery to the U.S. Navy in 2008. Northrop Grumman Newport News, headquartered in Newport News, Va., is the nation's sole designer, builder and refueler of nuclear-powered aircraft carriers and one of only two companies capable of designing and building nuclear-powered submarines. Newport News also provides after-market services for a wide array of naval and commercial vessels. The Newport News sector employs about 19,000 people.